Staff from the School of Engineering & School of IT had a jolly good time during the recent Christmas celebration held just days before the close of Year 2014. The Head of School, Professor Anthony Guo took this opportunity to thank all staff for their contribution throughout the year as he summarized the school’s performance and achievements for the year. The Christmas mood was brought alive with Christmas songs, decoration and gift exchange event. 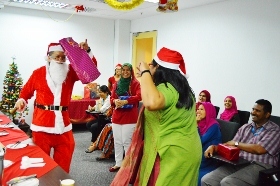 As the staff were indulging in the spread of snacks and cookies, an unexpected VIP appeared in their midst and it was none other than our very own in-house Santa Claus. Staff were excited to meet Santa and took photos and even danced with Santa. The exchange of gift was indeed the highlight of the event as Santa Claus gave away the gifts to all present in the party. It was a well-organised event, in which there was plenty of joy and laughter. After the long year, it also presented staff the perfect opportunity to simply unwind and relax, and enjoy the company of their colleagues.